Today’s dressgasm of the day is a rare specimen from the later part of the 1860s. It’s listed on eBay right now for a pretty penny and the seller estimates the year to be 1867. What makes it rare is the fact that the matching bonnet survived, in tact, with the dress after decades and decades. 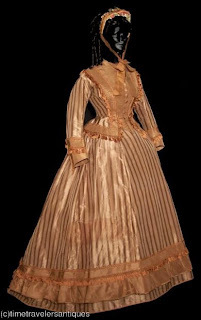 The dress is made of striped silk brocade in a cocoa color and it is two pieces — a bodice and a skirt — rather than a one piece dress. There were dresses for almost every daily activity in the upper class and this dress appears to me to be a visiting or walking dress. The sleeves appear to be modified coat sleeves, which were narrow and closed at the cuff as opposed to the wide bell-shaped pagoda sleeves of the 1850s. The best way to date a dress in the 1860s is by looking at the shoulder seams. Early in the decade, the shoulder seams fell a few inches below the natural shoulder to give the illusion of width so the waist would look smaller. As the decade progressed, the shoulder seams crept higher and higher until they were straight up and down by the end of the decade. The bonnet is a good example of a half bonnet from the late 1860s that preceded the bonnets of the 1870s. As the nineteenth century progressed, bonnets went from wide-brimmed, head-swallowing contraptions to small decorations resting on top of the head. 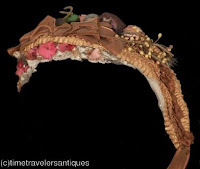 This example of late 1860s design is a woven straw bonnet over a wired frame with a tulle lining, fruit-like cloth accents, flowers and bows. There is also a pre-made bow to the chin ties. Straw bonnets with false flowers and decorations were probably the most common type of bonnet used by all classes. Wealthier women expressed themselves through more intricate decoration and better materials. >gorgous. how come no one dresses like this anymore? seriously!